THE tedious and dangerous task of searching the ocean’s bottom for sunken ships laden with treasures is simplified by a diving sled perfected in Germany. The floor of the ocean is literally strewn with ships which went down, taking with them to Davy Jones’ locker hundreds of millions of dollars in gold. The heavy weights which a diver must carry in his boots to counteract the weight of his helmet and the buoyancy of his air-filled garment, make it extremely difficult for him to do much exploration. Shifting tides frequently move big ships which have settled to the bottom of the sea and consequently divers are often unable to locate the treasure. The new diving sled is expected to overcome this. For in it, a diver can descend to the bottom of the sea and be towed for miles on the ocean’s floor. The diver takes his seat in a manner much the same as in an airplane. 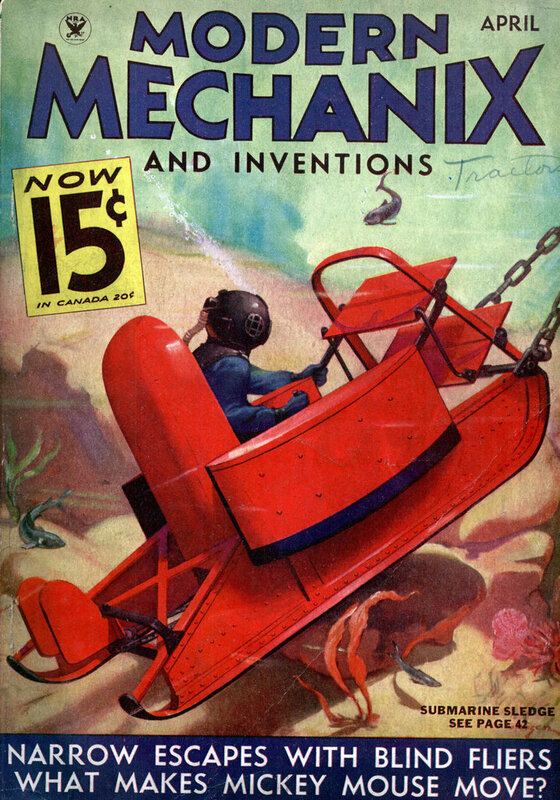 A tug lakes up the tow and when ready to dive, the operator simply pushes forward on a joy stick, which is about the same as an airplane control. This in turn works the diving fins. 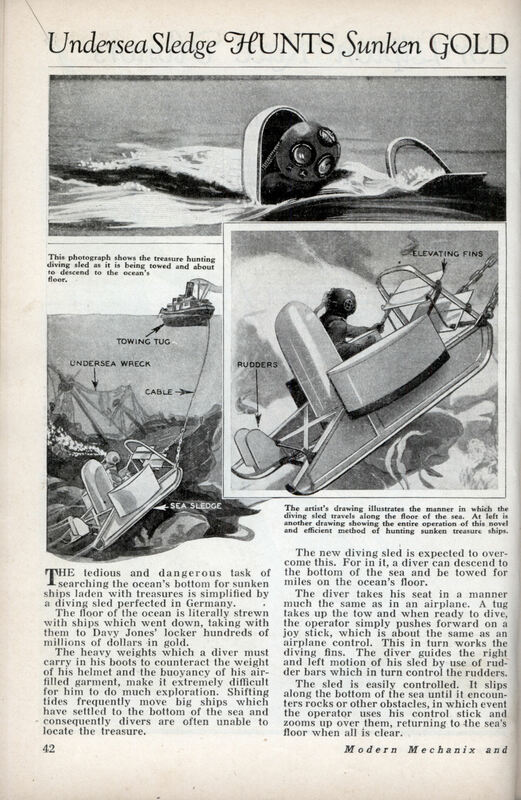 The diver guides the right and left motion of his sled by use of rudder bars which in turn control the rudders. The sled is easily controlled. It slips along the bottom of the sea until it encounters rocks or other obstacles, in which event the operator uses his control stick and zooms up over them, returning to the sea’s floor when all is clear. Sounds like a heck of a ride. The comment about the ocean being literally strewn with ships full of gold may be a bit of an exaggeration though.